TRAINING DAY: A miniature locomotive leaves the turntable for another run through its scenic model world. To say trains are Ray Jazyna’s life is no understatement. When the Norlane train driver of 35 years is not at work, he is likely working on his next model or in the US searching for it. 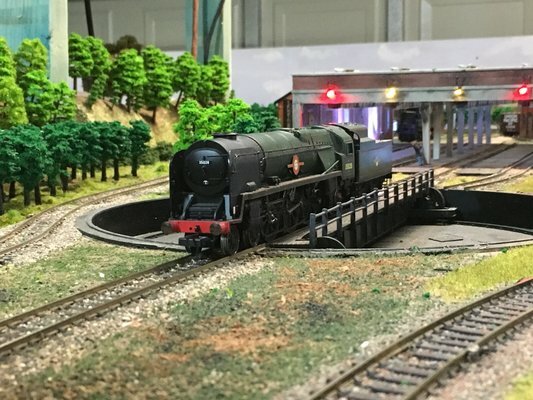 After 40 years on and off in Corio Model Railway Club, Ray has collected more than 300 model locomotives and about 600 wagons. “Too many,” the 55-year-old laughed. Some of his trains will feature in the club’s 46th annual exhibition at South Barwon Civic Centre, Belmont, this weekend. The club will give away showbags and hold a treasure hunt to inspire Geelong’s miniature conductors, as the trains chug along the tiny tracks. “The young ones love when they come through the tunnel or around a curve,” Ray said. Ray joined the club as a kid himself for “the love of model trains” at age 14. “Being a kid with no money, it was a bit hard at time to buy whatever was available,” he said. He began driving diesel trains from Geelong in 1984. “Every train was different and handled differently back then,” he said. Ray spent a lot of time in the US, where models were cheaper, he said. He and partner Barbara also visit vintage locomotives on their trips. “They’re far bigger, noisier and louder over there,” he said. They will fly to Canada for a Rocky Mountains holiday in May, before going on a search for the colossal Big Boy. US train company Union Pacific is rebuilding one of the 4.94m-high, 6000-horsepower locomotives, which has 1.7m wheels, to celebrate the 150th anniversary of the Transcontinental Railroad. “They’re bringing that big piece of machinery back to life,” Ray said. To find out more about the exhibition or the club, visit www.coriomrc.org.